“3 Things” is a weekly post of thoughts I am pondering, usually contrarian, with respect to the markets, economy or portfolio management. Comments and thoughts are always welcome via email, Twitter, and/or Facebook. Despite mainstream economists hopes that somehow “this time will be different,” the ongoing massaging of economic data through seasonal adjustments to obtain better headlines did not translate into actual prosperity. Of course, “reality” is a cruel mistress and despite ongoing hopes and overstatements, “fantasy” eventually gives way. The chart below shows the S&P 500 index with recessions and when the National Bureau of Economic Research dated the start of the recession. The last two-quarters of economic growth have been less than exciting, to say the least. However, these rather dismal quarters of growth come at a time when oil prices and gasoline prices have plummeted AND amidst one of the warmest winters in 65-plus years. Why is that important? Because falling oil and gas prices and warm weather are effective “tax credits” to consumers as they spend less on gasoline, heating oil and electricity. Combined, these “savings” account for more than $200 billion in additional spending power for the consumer. So, personal consumption expenditures should be rising, right? What’s going on here? The chart below shows the relationship between real, inflation-adjusted, PCE, GDP, Wages and Employment. The correlation is no accident. Economic cycles are only sustainable for as long as excesses are being built. The natural law of reversions, while they can be suspended by artificial interventions, can not be repealed. More importantly, while there is currently “no sign of recession,” what is going on with the main driver of economic growth – the consumer? The chart below shows the real problem. Since the financial crisis, the average American has not seen much of a recovery. Wages have remained stagnant, real employment has been subdued and the actual cost of living (when accounting for insurance, college, and taxes) has risen rather sharply. The net effect has been a struggle to maintain the current standard of living which can be seen by the surge in credit as a percentage of the economy. To put this into perspective, we can look back throughout history and see that substantial increases in consumer debt to GDP have occurred coincident with recessionary drags in the economy. Furthermore, the recent decline in rates likely suggests a much weaker economic environment than is currently expected. The last time that rates were this low, and potentially heading lower, was during the economic slowdown in 2012 which bordered on a recession. The difference is that in 2012 the Federal Reserve was in extreme accommodation mode, profits were growing and multiples were expanding. That is not the case today. In July, the BEA will negatively revise the economic data going back over the last eleven years. Importantly, these aren’t the only forthcoming revisions. The extremely warm winter weather is currently wrecking havoc with the seasonal adjustments being applied to the economic data. This makes every report from employment, retail sales, and manufacturing appear more robust than they would be otherwise. However, as the seasonal trends turn more normal we are likely going to see further negative adjustments in future revisions. Here is my point. While my call of a forthcoming “recession” may seem far-fetched based on today’s economic data points, it should be remembered that no one was calling for a recession in early 2000 or 2007 either. The takeaway of all this is the risk to equities may be higher than currently expected. If rates, economic data trends, and valuation reversions are sending the correct message, the forthcoming negative revisions to the underlying data will derail the current bullish thesis of a profits recovery in the making. Why is this important? Because it is the ongoing rot of corporate balance sheets and obfuscation of earnings that are a potential trap for investors. Yesterday, the problem got even worse following the release of the “stress tests” which immediately led to a stock buyback, dividend boosting, frenzy in a sector already plagued by low net interest margins – the banks. Goldman Sachs: Will buy back stock, but did not release the amount. Just as a reminder, In 2007, S&P 500 firms allocated more than one-third of their cash to buybacks just before the S&P 500 plunged by 56%. There are many layers to this magical onion. If Eugene Fama was correct, an efficient market would reduce the P/E ratios to account for the rot contained in the balance sheet. 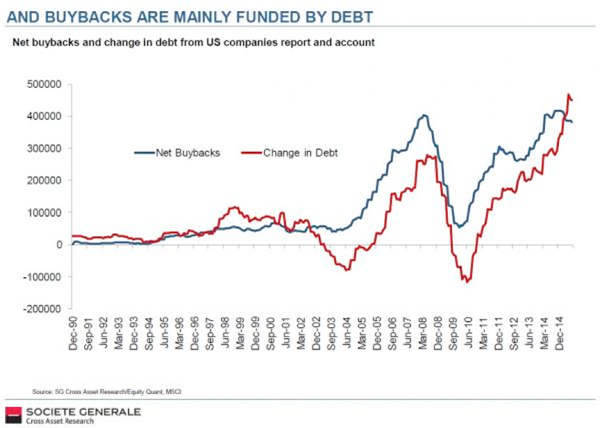 Leveraged share buybacks are a zero-sum game (like stock splits). Just a quick update to Tuesday’s discussion on the market. “We can benefit from the alignment of policies. What I mean by alignment is a shared diagnosis of the root causes of the challenges that affect us all; and a shared commitment to found our domestic policies on that diagnosis.” – Mario Draghi at the ECB Forum in Sintra, Portugal. The first is that volume has declined during each day of the rally. While both days were 90% up days in terms of positive stock performance, the negative divergence in volume is concerning. Secondly, the rally in the market is currently retesting the 50-day moving average which is currently acting as resistance. The market must reclaim the short-term moving average if another attempt at 2100 is going to be made. The biggest concerns, however, remain at price momentum remains weak and with both price and volume oscillators currently on “sell signals,” the risk of a failed rally is currently high. The rally on Tuesday and Wednesday was not unexpected. With the markets oversold on a short-term basis, end of the quarter portfolio “window dressing” at hand, and soothing comments from Central Banks, the rally off of critical support at 2000 was certainly viable. The question now becomes sustainability. As we head into the depths of the summer months, all eyes should begin to focus once again on the month of August. The potential of a rather severe market rout in August and September from a technical perspective is extremely high. Despite the rhetoric, the best thing that investors can likely do this summer is to continue operating at reduced risk levels in portfolios. 3 Things: Retail-less, Valuation, End Of The Bear?